Ponte de Lima, part of a bucolic scenery of mountains, vineyards and fruit gardens, is a course typical of the Minho region. Located over the skirts of Madalena hill, Ponte de Lima course is a typical mountain course, covering six kilometres adorned with luxurious vegetation and well restored, historical mansions, which supply infrastructure for golfing activity. The first nine holes are placed amongst age old trees (chestnut trees, cork and English oaks), leading through a ravine to Quinta da Anquiao, where holes number 1, 2, 8, and 9 provide glorious views over the Lima Valley and Viana do Castelo, a town 20 kilometres away. Hole number 3 (par 5) at 622 metres is one of the longest in Europe; hole 8's tee (par 3) is situated higher, allowing one to attack the green directly below. The next nine holes are sited in the Quinta de Pias valley with its surrounding vineyards, corn fields, apple and pear trees. One hour’s drive from Amarante and the next golf course, Ponte de Lima came into view. The layout is varied and interesting and involves playing across a mountain. The first nine holes offers exceptional views from the top on Holes 2 and 8. Number 3 may be Portugal’s longest hole; if not, it seems so. 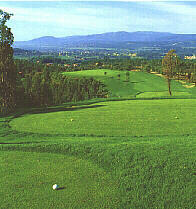 It is 622 metres long, flanked by forest and with a dogleg right. Players have an easier, flatter time of it on the second nine, especially if they’ve taken advantage of the club restaurant and stopped for lunch and recuperation. The restaurant is lively and very popular with local business people as well as golfers. Ponte de Lima provides Strokesavers free which keeps players in a good mood. Many greens are invisible from the tees owing to doglegs and other incidentals. Further (also free) advice from the Course Director is to keep your driver out of play during the first nine; use a 3 wood instead. “The course requires you to think,” he added. The single most striking aspect of Ponte de Lima is its natural features. Trees, mountains, vineyards and flowers typify the Minho region and are more integral to this particular course than to any other in the area. Scots engineer Ian MacPherson was insistent that no one meddle with nature. Arguments (there were many) were met with adamant refusal to compromise. We are indebted to him for his intractability, for the golf course is far better as a result of it." The club is on the left in 1 km. Self catering Cottages and Houses with shared pool, usually in the grounds of a Manor House.